The prototype of a 22-kW synchronous reluctance motor from KSB demonstrates the potential that modern silicon carbide components offer in terms of heat management and increased output per size. As 2017 drew to a close, the KSB Group finished the prototype of a super-compact high-efficiency motor with an integrated frequency inverter. 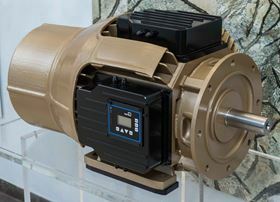 The 22-kW synchronous reluctance motor is a prototype featuring new semiconductor technology that provides completely new cooling management for eliminating heat from power electronics. By integrating the frequency inverter into the motor, developers were able to reduce the unit volume by over 25% compared with the traditional design. Besides German and French specialists from the pump manufacturer, scientists from the Karlsruhe Institute of Technology (KIT) were also involved in developing this prototype. The aim of developing this demonstration drive was to highlight the potential that modern silicon carbide components offer in terms of higher motor ratings. Today, almost 70% of all standardised pumps operate at a constant motor speed. To adjust the pump to the desired operating point, the impeller can be trimmed. In the future, Industry 4.0-ready motors will do this by way of ‘virtual impeller trimming’. This can be done even after the pump set is commissioned. Frankenthal-based KSB Aktiengesellschaft has recently introduced a new type series of stainless steel submersible borehole pumps, the UPAchrom 100 series.